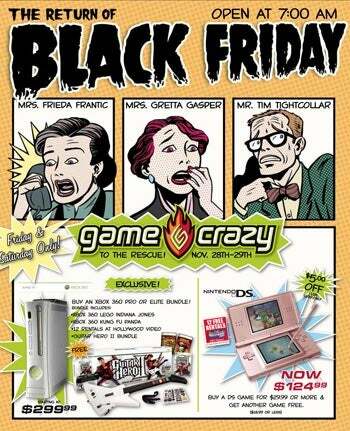 As a part of our ongoing quest to provide you with Black Friday deals from every store in the entire country, we give you Game Crazy's four-page Black Friday ad, bursting with delicious savings. As is often the case with Black Friday ads, you may not find the freshest games on Game Crazy's list if you poke about there are some rather nice deals, especially on early Friday morning, when you can get Far Cry 2 for the PlayStation 3 or Xbox 360 for only $39.99. Otherwise it looks like a nice shop for picking up on some older games you might have missed. Assassin's Creed and Rainbow Six Vegas 2 for $9.99 is nothing to sneeze at, and if you've never played The Darkness, $4.99 is a completely insane price. Hit the jump to browse all four pages, oddly stylized to look like blown up comic strips from the 1950's. Marketing people are so crazy.